You will love our Touch-On Touch-Off Delta faucets! Whether you have two full hands or 10 messy fingers, Delta Touch2O Technology helps keep your faucet clean, even when your hands aren’t. A simple touch anywhere on the spout or kitchen faucet handle with your wrist or forearm activates the flow of water at the temperature where your faucet handle is set. The Delta TempSense® LED light changes color to alert you to the water’s temperature and eliminate any possible surprises or discomfort. Experience the convenience and control of Delta kitchen faucets featuring Touch2O Technology. Who knew a faucet could be so safe and easy to use? Now that is Sierra Remodeling cool! From kitchen faucets to pot fillers, dish soap dispensers and sink accessories, Delta has every fixture for the kitchen that holds up well against the hard Arizona water. Delta Touch2O Technology helps keep your kitchen clean by giving you three ways to operate your bathroom faucet: manually with the handle, with a simple touch anywhere on the spout or faucet handle, or by placing your hands near the faucet. The high-tech capacitance sensing capabilities of Touch2O faucets allow the flow of water to be activated by breaking the capacitance field anywhere around the device, unlike traditional hands-free infrared sensors which require your hands be in a particular place and are sensitive to lighting conditions and clothing and skin color. Delta SpotShield Technology helps to keep your kitchen faucet cleaner, longer by resisting water spots and fingerprints. With the addition of antimicrobial protection of the finish, Spotshield Finishes also help to reduce stain—and odor—causing microbial growth on the faucet finish. SpotShield™ Stain Resistant + Spot Free Technology by Delta Faucet: Sierra Remodeling helps to keep your faucet cleaner, longer! Delta® ShieldSpray Technology delivers a simple yet practical means to clean with laser-like precision while containing mess and splatter. A concentrated jet of water powers stubborn messes away as an innovative water shield simultaneously contains splatter and clears off the mess. Together, these actions decrease the time spent soaking and scrubbing dishes and even shirt swapping based on splatter. Experience a faucet that performs like new for life with Delta DIAMOND Seal Technology. Our patented design reduces leak points and lasts twice as long as the industry standard*—ensuring leak-free operation for the life of the faucet. Everything you need is together in one convenient box, including integrated supply lines. Using diamonds, the hardest naturally-occurring substance on Earth, we’ve engineered a faucet that’s longer lasting, leak-free and less hassle to install. Who knew a faucet could be just as beautiful on the inside? Learn more about our Delta kitchen faucets! Come visit our showroom floor located at 1840 S. Highway 92 in Sierra Vista, Arizona or give us a call at (520) 459-3164. We researched 5 or 6 contractors who would build our home on our property for the amount of money we could afford. Howard Richter (of Sierra Remodeling & Home Builders) not only quoted on building the house, but included permits, site plans and construction blueprints in the quote. He handled all permits with the county and the association, arranged all subcontractors including the electric company, hooked up our well, and graded our land – all without increasing the cost to me. He quoted a date for completion and met it exactly. He also gave us a break on items he had in storage that were upgrades on the quality that we could afford to buy. We couldn’t have been happier with his listening to all our desires and showing interest in making our home special for us. 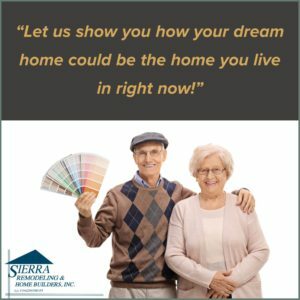 Howard Richter of Sierra Remodeling & Home Builders handled the construction of our home from start to finish with devotion to pleasing us. He gave us his personal phone # at the start and was always available to answer any concerns we had. After completion of the construction, he has followed up on the minor problems such as a sticky door, one back-ordered window screen and a shelf we had difficulty adjusting.